The following content is sponsored by Sears. All opinions are my own. They say the kitchen is the heart of the home. I would tend to agree. It’s certainly the most lived-in room of our house. It sees the most action. And it probably sees the most joy. It’s here where we cook, where we eat, where we chat over washing dishes. The kitchen is where I spend much of my days, either feeding my small army of children or dreaming up yummy messes to eat — or both. We’ve lived in six homes since we got married almost twenty years ago. Two of those were short-term rentals, so they don’t really count. The other four? They’ve become a part of our collective family experience, a part of my memories, a part of our food culture. When FishPapa and I first married, we lived in a 200 square foot studio cottage. The kitchen was an afterthought, built as a lean-to on an existing building. We lived there for a full three years, welcoming our first baby into our very humble little abode. I had to dig for a picture because we got married in the Dark Ages, or at least before digital cameras, and came up empty. Just imagine a very small kitchen with a farmhouse utility sink and the smallest refrigerator after a dorm-size model. We didn’t plan to be there that long, but the rent was great, the landlords were superb, and we were comfortable. While we were there, I started freezer cooking, learned to bake biscotti, and brought friends home after Sunday night church so that we could eat good food and dream big dreams together. I remember my landlady brought me Cheese Enchiladas for my first meal home from the hospital. She held my baby while I ate the best meal I’d had in days, maybe even years. I loved this kitchen because it was our first home together. When our firstborn was one year old, we bought our first house. Silly us, we thought that would be our forever home. We gutted the entire downstairs and remodeled it all. It was going to be my dream kitchen. We had more time than money in those days, so we lived with things “in process”. That means that the floor was concrete; the walls were open studs; there was no ceiling. The benefit to this was that we chopped up the room several different times and moved the components around until we found a configuration we liked. It turned out to be a really good method. If we’d had money to do it all at the beginning, we might have made decisions we didn’t like. In the end, we decided to relocate to Kansas City, so we just hurried up and finished. It did not become my dream kitchen after all, but it was still pretty nice. We brought home two babies to that house, had three miscarriages, and learned a lot about life. We hosted a homegroup, entertained friends, and I cooked my first full-fledge Thanksgiving meals in that kitchen. I taught myself to make tamales and to make jam in that kitchen. I loved this kitchen because it was ours. In Kansas City, after renting for six months, we found a house we wanted to buy. I fell in love with the kitchen backsplash. That was the first thing I noticed when we walked through the house. It was also the design I had chosen for my dream kitchen. I thought that was nice of God to give me that little boon. Even though the house was two years old, it had sat empty the entire time, evidence of overbuilding in the ‘burbs. The back windows didn’t open which made it beastly hot in the summer time. There was no access to the backyard — unless you wanted to jump off the deck outside the kitchen. That was kinda rough on potty training kids who were playing out back. That was our first home improvement — to add a back door out the basement landing. Over time we repainted, hung sunshades to block the summer heat, and learned how to clean the beautiful-yet-hard-to-clean tongue and groove floor. That kitchen saw us add three more babies to our family as well as walk through the early stages of debt-reduction. I made many batches of Bean Tostadas and Rice and Beans in that kitchen. I really loved that house. Even though I was glad to be moving, it would have been nice to take that house with us. 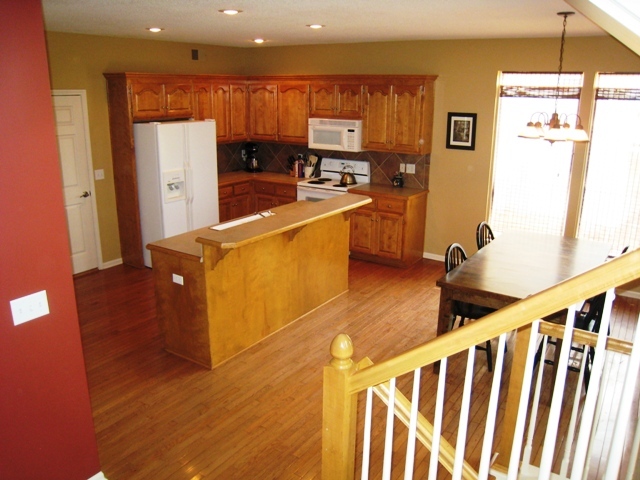 I loved this kitchen because it saw us through some very tough times and brought us comfort. Our current kitchen doesn’t really belong to us. We are caretakers on behalf of the owners who live in Australia. We’ve lived here for four years. For some of our kids, this is the only kitchen they remember. We’ve made Monkey Bananas and Monkey Salad, and done all kinds of monkeying around. This kitchen, despite its age and dated countertops, has served us well. It has ample storage space for all the food it takes to feed six kids as well as for my largish collection of small kitchen appliances. A couple years ago the owners replaced the dishwasher, sink, microwave, and oven, so we’re in good shape when it comes to major appliances. Savvy observers will note that the refrigerator (ours) has lasted quite some time. I believe it turns 11 this Thanksgiving, having made it through most of our kitchen experience. This room has served us well, in richer and poorer, in sickness and in health. A lot of the recipes I’ve shared with you, the bulk of them really, have been prepared and photographed in this kitchen. I’ve written three cookbooks from this kitchen. So, in some ways, though it isn’t “ours” in the true sense of the word, it’s still the Good Cheap Eats kitchen. I love this kitchen because it sustains us and helps us live out some big dreams. I haven’t found my dream kitchen yet. 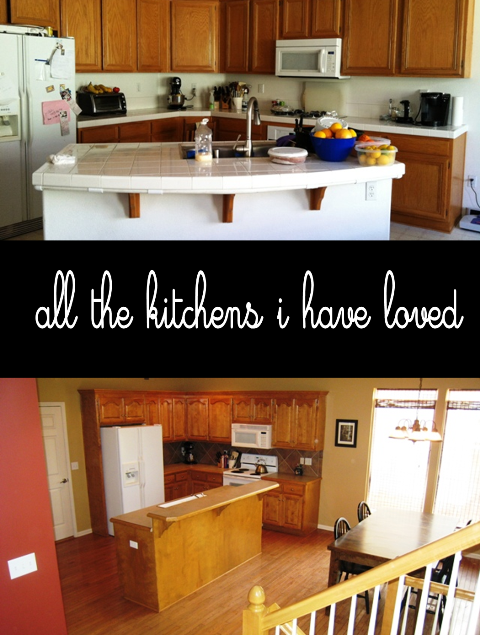 Sure, there are things that I would change about my current kitchen, as well as all the others I’ve loved before. Over time, I’ve learned which are the things that I like or prefer. I like formica countertops (yes, really — easy to clean), wood floors, double ovens, gas stoves, a trash drawer, ample storage, and space for a big table. These are a conglomeration of all my former kitchens, all the things that were good and wonderful about each one. And I’ve also learned that the best thing about any kitchen, is, as Bilbo Baggins once said, good food, a warm hearth, and all the comforts of home. What about your dream kitchen? Do you have an idea for a dream kitchen? While I know we can all make do with what we have, it’s still fun to dream and imagine and plan for improvements in our cooking stations. When you have a kitchen where you love to cook, you will naturally cook more, and that is a very good thing. 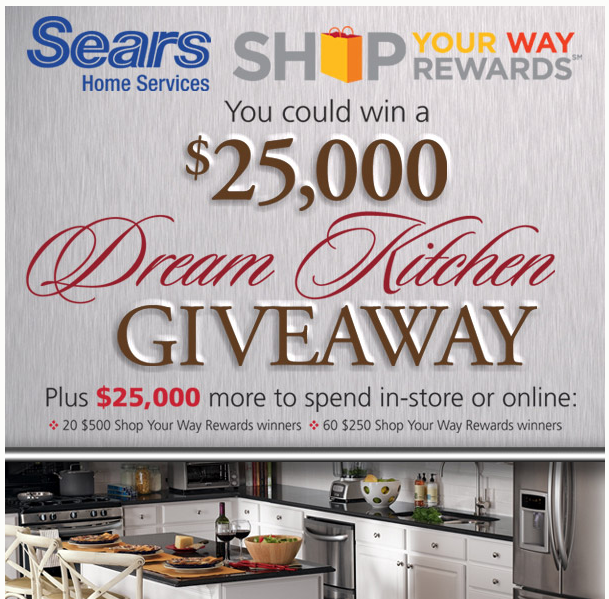 Currently Sears and Valpak are partnering to bring folks the chance of a $25,000 Dream Kitchen Giveaway. The prize includes an extra $25K to spend in store. Can’t complain about that, can you?! Enter today for your chance to win. I’ll be chatting about my dream kitchen (both literally and figuratively) at the #SearsKitchen twitter party on November 4 at 12 noon PST/3 pm EST. Chime in and tell us your dreams when it comes to kitchens. Sears will be giving away (1) $100, (1) $200, and (1) $300 Sears gift cards during the party. What would you change about your kitchen? Disclosure: I have been compensated by Sears for my time spent writing. All opinions are my own. I loved reading about your kitchens. It even made me a little teary thinking of all of the Kitchens I have had (somewhere in the range of 8-10 in as many years). Its amazing how the kitchen becomes the heart of your home. I definitely agree about the Formica counters. They are way easier to clean than granite. Also I would never have a black stove again by choice (as I do now) because they never never never get clean. Same goes for a black stand mixer. Shows every bit of dust and flour. I loved your quote “When you have a kitchen where you love to cook, you will naturally cook more, and that is a very good thing.” So very true! When my husband (BF at the time) and I moved out together 13 years ago, I didn’t know how to cook. I cooked very few things, but I do remember us eating at home and cooking meals together in our tiny apartment kitchen, shopping in bulk at Costco for the best deals and splitting up the meats into manageable sizes for the two of us and freezing them. These are my kitchen memories from there. My cooking meal plan was only a handful of things back then. We have moved several times since then, living in our 6th kitchen together now. But, with each kitchen we have had since then I have added more to my game plan and am now a good cook. I cook 99% of the time now and love to do it. Your quote hit so close to home for me. I remember cooking in our couple of apartment kitchens before we got married, but sparingly. After we got married and moved 2500 miles away to our first home that we bought, I began to really get into cooking because the kitchen felt like mine and I actually had a ton of space to work. We are onto our second home now and I love this kitchen even more. I think that is a huge reason why I cook so much now. I love our kitchen, it works well for us, and because it’s mine I enjoy creating in it. Just as you said, there are always a few things to change kitchenwise. I love our hardwood floors, granite countertops, deep stainless sink, our backsplash and my Samsung oven. In our next kitchen (we hope to build again this next year), I want an island again, we will ditch the LG appliances and get all Samsung because our oven ROCKS, and I would love to have a window looking out to a lake from the kitchen sink. Thank you for this post. It brought up so many memories and I had a fun time thinking about them all. It amazes me how great that quote is, I had never thought about it like that before but it is so true for me. Love this post, I don’t have a gourmet kitchen by any means, but it is still where everyone gravitates to when they are over. Good food and love makes any kitchen warm and cozy! I would love a double oven and a big farm house sink if we had the means to remodel, but we have created so many wonderful memories in this kitchen that I still love it the way it is. 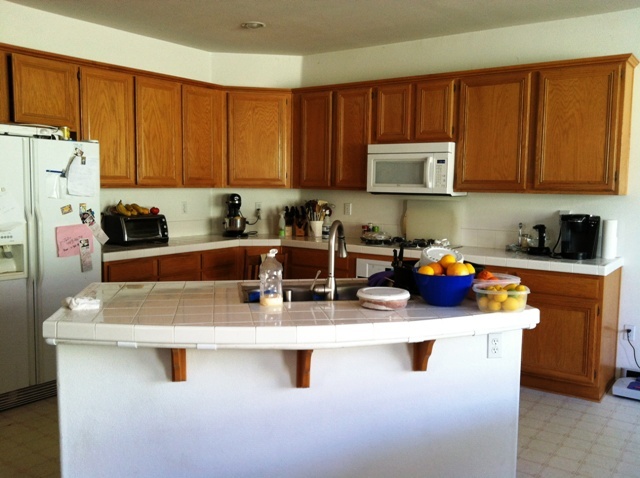 I love the layout and functionality of my kitchen and if I had the money to remodel, I’d build it exactly the same. The kitchen is old and needs a facelift, but whoever designed it did a great job configuring the counter space and cabinets. Plus, it opens to a large sunroom so when everyone invariable congregates in the kitchen, there’s plenty of room for all the bodies. My only problem is that the trash can doesn’t have a great home and always seems to be in someone’s way. A good footprint is essential! As for the trash, I think that’s why those trash drawers are so popular. My kitchen is tiny. Really tiny. You can’t actually fit two people in it very easily. I’d like to be able to say I love it because it’s where I made my wedding cake but honestly, I can’t find anything to love about a kitchen with no drawers (not even one) one under-counter cupboard and four over-counter cupboards (two of those only 2/3 height) there isn’t even room for a freezer. The rubbish bin is in the hallway. Just too small! So my dream kitchen is all about space. I’d want a table. So people can sit and eat, or just chat while someone cooks. I don’t want cooking to be enforced time away from friends and family, I want the kitchen to be part of the house. I’d love a drawer for cutlery, instead of a pot. And enough cupboards to store food. Even enough cupboards to have some appliances. Now that would be wonderful! And a big freezer so I can do more freezer cooking. My dream kitchen isn’t about particular appliances, or colours, or even layout – although I know how important those are. I just long for one bigger than a shoe box!